EDITOR’S NOTE: We updated the post to include a new female National Athlete of the Week in NJCAA Division III. NEW ORLEANS – We’re making history and continuing trends to begin October. For the first time in the five-year history of National Athlete of the Week, two athletes from the same NCAA Division I university earned the honor. And for the third year in a row, two NCAA Division III athletes repeated as National Athlete of the Week on different weeks. Without further ado, here are the 10 men and women who were named National Athlete of the Week by the U.S. Track & Field and Cross Country Coaches Association (USTFCCCA) on Monday. Morgan McDonald made his triumphant return to the grass circuit this past weekend. McDonald, who redshirted the 2017 season to have a chance to win the NCAA individual title on his home course, beat a talented field at the Nuttycombe Wisconsin Invitational. He crossed the finish line in 23:17.6 as he pulled away from Iowa State’s Edwin Kurgat down the stretch. That was McDonald’s first cross country race since he placed seventh at the 2016 NCAA Division I Cross Country Championships. It was in 2016 when he also won the Big Ten title and placed second at the Great Lakes Region Championships. McDonald is the first male athlete from Wisconsin to be named National Athlete of the Week during the cross country season. He is the second Big Ten male athlete to earn National Athlete of the Week honors this year, joining Penn State’s Colin Abert (September 10). In a race that featured four of the top-10 finishers from NCAAs the previous year and the individual champion from that same race, it was the woman who finished 139th in Louisville, Kentucky, last year who had her breakthrough performance this past weekend. Alicia Monson took down Weini Kelati, Ednah Kurgat, Dani Jones and Allie Ostrander on her way to the individual title at the Nuttycombe Wisconsin Invitational. Monson crossed the finish line in 19:33.3, two full seconds ahead of Kelati and five full seconds ahead of Kurgat. This was the second win in a row for Monson, who also captured the individual title at the season-opening Badger Classic two weeks ago. Monson is the first female athlete from Wisconsin to be named National Athlete of the Week during the cross country season. She is the first female athlete from the Big Ten to be named National Athlete of the Week since Jillian Hunsberger (Sept. 11, 2017). Sydney Gidabuday earned a National Athlete of the Week honor after the senior finished as the top collegiate athlete at the Stanford Invitational after posting a mark of 23:55.6 on the 8K course. The Orange, California, native bested a field that included some of the top-ranked Division I programs in the nation as he helped Adams State to a third-place finish overall, behind just host Stanford and UCLA. Believe it or not, Gidabuday is the first Adams State athlete to collect a National Athlete of the Week award during the cross country season from the storied program. Kayla Wooten picked up a National Athlete of the Week award after she won the Maroon Race at the Roy Griak Invitational this past weekend. The junior recorded a time of 21:55.9 for the 6K course and bested the runner-up by nearly five seconds. It is just the second National Athlete of the Week honor that the program has received in school history, of which Wooten owns both. North Central (Ill.) took the show on the road to the Louisville Cross Country Classic this past weekend and Dhruvil Patel starred once again. Patel finished fourth in the 252-man race behind a trio of NCAA Division I athletes and paced the NCAA Division III No. 1 Cardinals to the team title over NCAA DI Kentucky, among others. He crossed the finish line in 23:51.0, which was a PR for him on the course. The last time Patel competed on the 8K tract at E.P. “Tom” Sawyer Park, he finished in 24:41.6. The senior from Skokie, Illinois, earned his second National Athlete of the Week honor of the season. Patel also nabbed it two weeks ago after a victory at Illinois State Invitational. Sam Slattery continues to prove that she could be a dynamo come November. Slattery surged to a win this past weekend at the UW-Eau Claire Blugold Invitational, which featured five teams that were ranked in the last NCAA Division III Women’s National Coaches’ Poll. She pulled away from Carleton’s Emma Greenlee and Wheaton (Ill.)’s Hannah Roeske down the stretch to win in 22:06.8. Roeske was a five-time All-American in 2017-18 with at least one award in each of the three sports. The junior from Wanuakee, Wisconsin, collected her second National Athlete of the Week honor of the season. Slattery also earned it two weeks ago after a victory at the Augsburg Invitational. Andrew Bosquez was selected as a National Athlete of the Week after he picked up a win at the New Mexico Junior College Cross Country Invitational. The sophomore paced the field with a winning-time of 21:35.4 for the 7K course. Bosquez is the first male and just the second athlete overall in program history to get honored with the National Athlete of the Week award from South Plains. Everlyn Kemboi was named a National Athlete of the Week recipient after she won the New Mexico Junior College Cross Country Invitational this past weekend. The freshman paced the field with a 17:43.5 performance for the 5K course. 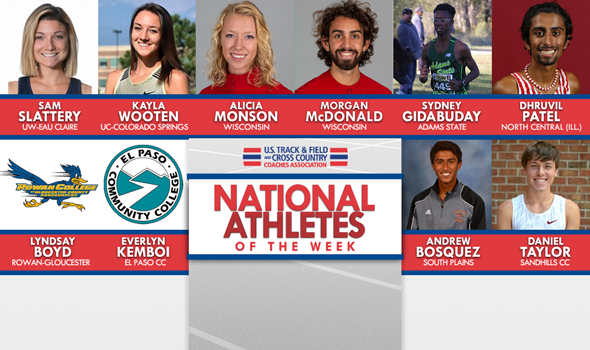 Kemboi is the first athlete in program history to receive a National Athlete of the Week award. Daniel Taylor collected a National Athlete of the Week nod after he finished 28th overall in a stacked field at the Queen City Invite. Taylor recorded a 25:41.0 performance on the 8K course. It is just the second National Athlete of the Week honor in program history as Taylor was also named a National Athlete of the Week during the 2017 season. Lyndsay Boyd was the top finishing junior college athlete this past weekend at the Don Cathcart Invitational hosted by Salisbury University. This is the first time Boyd has been named National Athlete of the Week in cross country and the third time the Roadrunners’ program has been recognized by the USTFCCCA since the creation of the award in 2015.